The interactive map below shows the location of the Addo National Park in South Africa. Zoom in to see a close up view of the Park. 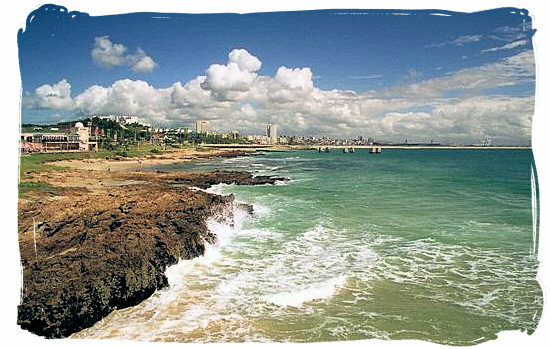 The park is situated about 80 km north-east of Port Elizabeth, capital of the Eastern Cape Province. Addo Elephant National Park is the only national park in South Africa where you can find the Big 7 (Elephant, Rhino, Lion, Buffalo, Leopard, Southern Right Whale and Great White Shark) in their natural habitat. The following maps may also come in handy. View a map showing the locations of the Addo Elephant National Park and the city of Port Elizabeth. View a map of the lay out of the Addo Elephant National Park itself in pdf format. Go to SANParks.org to view a map of Addo Elephant National Park’s main camp and its immediate surroundings. The airport nearest to the Addo Elephant National Park is at Port Elizabeth, 75km away from the park. A number of car hire companies have depots at the airport. International airports are situated at Johannesburg and Cape Town, with a choice of connecting flights available to Port Elizabeth. From Port Elizabeth (PE): Take the N2 highway towards Grahamstown. Take the turnoff to the left signposted "Motherwell" and "Addo Elephant National Park". Turn left at the top of the off-ramp and proceed through Motherwell. Follow this road until you see the entrance to the park on the right. Distance from PE to the Park is about 72km. Alternative route from Port Elizabeth: Take the N2 highway towards Grahamstown and carry straight on until the N2 splits off to the left from the N10. Continue with the N10 towards Cradock/Cookhouse. Take the R342 to the left when you get to the intersection with Paterson on your right. This will be sign posted "Addo Elephant National Park". Follow this road, looking out for the entrance to the park on your left. From Grahamstown: Take the N2 towards Port Elizabeth. Follow this road until you see the turnoff to the N10 towards Cradock/Cookhouse. Take this turnoff and Carry straight on, continuing with the N10 towards Cradock/Cookhouse. Take the R342 to the left when you get to the intersection with Paterson on your right. This will be sign posted "Addo Elephant National Park". Follow this road, looking out for the entrance to the park on your left.